Images and Drawings: Courtesy Bijoy Ramachandran; ©Hundredhands. 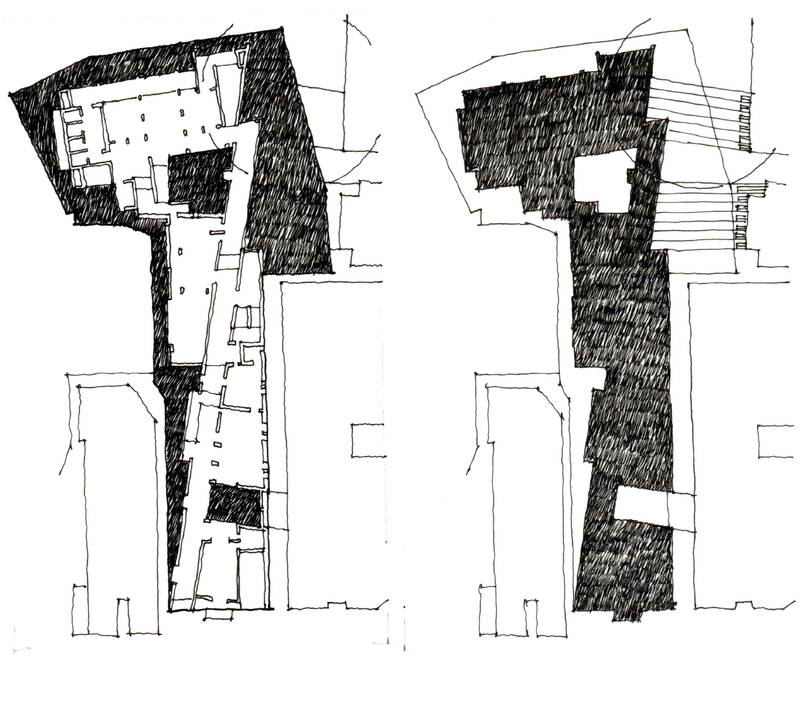 Drawings reflect the significance for detailing in design. The mere fact that drawings are such beautiful graphic works suggests the care rendered not only to representation but design as well. This precision is amplified by the use of lines which are carefully articulated to emphasize on the nuances of the detail. The relationship between drawings and lines is taken to a level of meticulous representation. An interaction of the mind, the eye and the hand inherently formulates a language unique to an individual in terms of style but holding common grounds as a mode of expression. 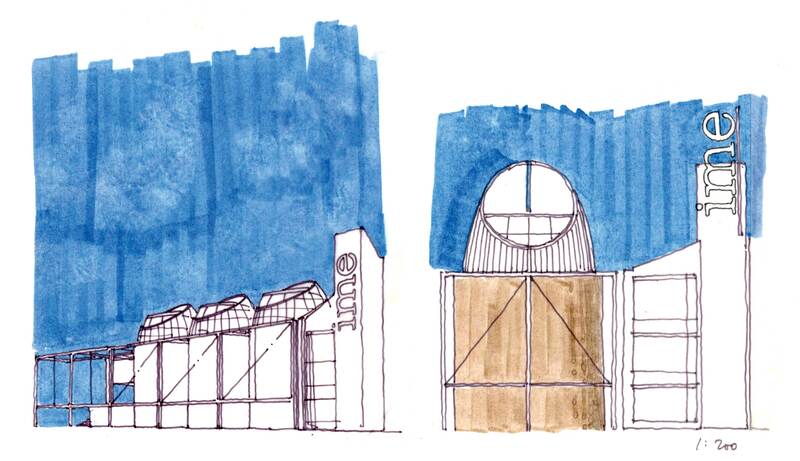 The process of drawing in Hundredhands is an intrinsic part of the Architectural journey at the studio. A reflection of process stages of a project, drawing starts with a conceptual idea – mostly depicted using a fluid medium – a pencil – which allows greater freedom of thought. The initial representation is a simplified form of a plan (a scheme). The initial thoughts portray the idea with a level of abstraction by a figure-ground relationship which may be further enhanced by the use of colour. As the idea develops the drawing moves through layers of increasing detail and transforms. The strictness of a thin-point pen now comes into play. 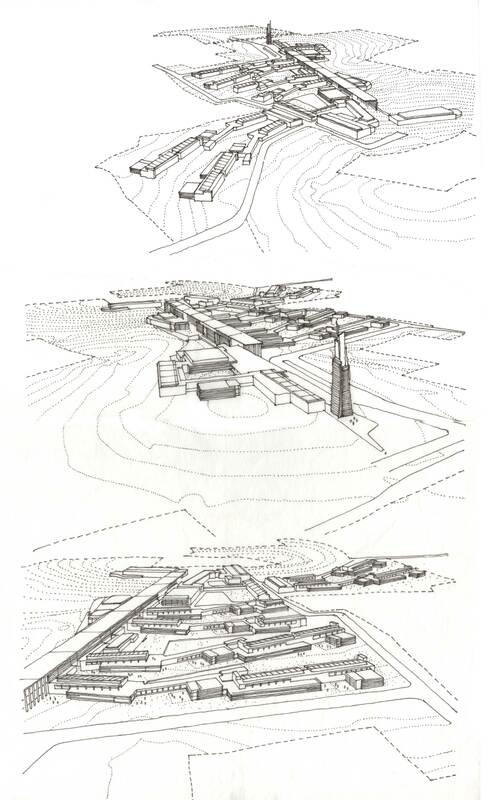 Concurrently intricacies seep in, and the language develops into more complex modes of axonometric and three-dimensional views with increasing detail. During this drawing phase an obvious emphasis is on the composition of lines. Line-weights come into play as the medium remains unchanged, thus drawing attention to the hierarchy. The change in lines – weight and quality – is clearly visible when representing the built and its surrounding landscape. The crisp straight line, the dark bold line, the subtle dotted line: all in a harmony of composition. As the stages of thought progress, there is a greater emphasis on the clarity of composition and content of the drawing. Slowly, the drawings start to become more detailed, more precise and have greater clarity in terms of architecture that they represent. In the drawings of Hundredhands, the use of colour is calculative. In the plan, the essential idea shaping its evolution is highlighted in colour and stands out as the most important element while in elevations; colour may depict material thus creating a picture which guides the eye around the core ideas, finally letting it rest on its details. At Hundredhands, drawings play a subconscious yet pivotal role on the evolution of projects, reflecting each stage as the progression on the previous; eventually filtering into the building. A conversation between Bijoy Ramachandran of Hundredhands and Ruturaj Parikh on the idea of drawing and its connection to development of architecture at Hundredhands. 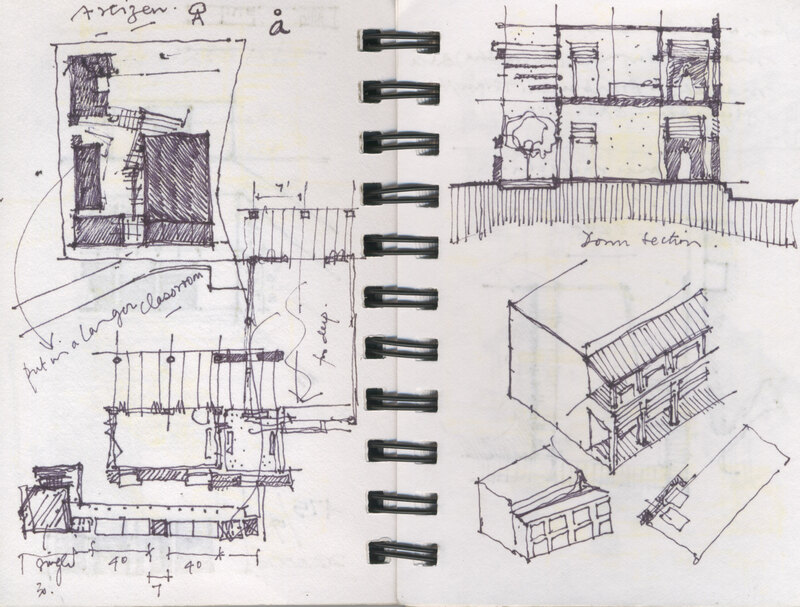 RP: Drawing – especially hand drawing is an integral part of your practice. How did you develop your affinity to this particular process? BR: Well, I am from the Stone Age – the time before computers. We had a wonderful teacher, Anil Dube, who really helped me appreciate the value of drawing. We made incredible building construction plates for him and he always showed us new ways to represent things. We do not consider this as important enough. A good representation reveals one’s intentions and often furthers the process of design. Drawing well (whether by hand or using a computer) is key to conveying to oneself and others the value of one’s propositions. I also find that in drawing again and again, solutions and alternatives magically reveal themselves. My recent experience at the Glenn Murcutt Masterclass was an affirmation of this. In simply recording/documenting/drawing exhaustively the existing condition, one begins to see patterns and in Glenn’s words, one ‘discovers the way to occupy/shape the landscape’. RP: What is the nature of this process? How do you see the process of drawing intrinsic to your work at Hundredhands? 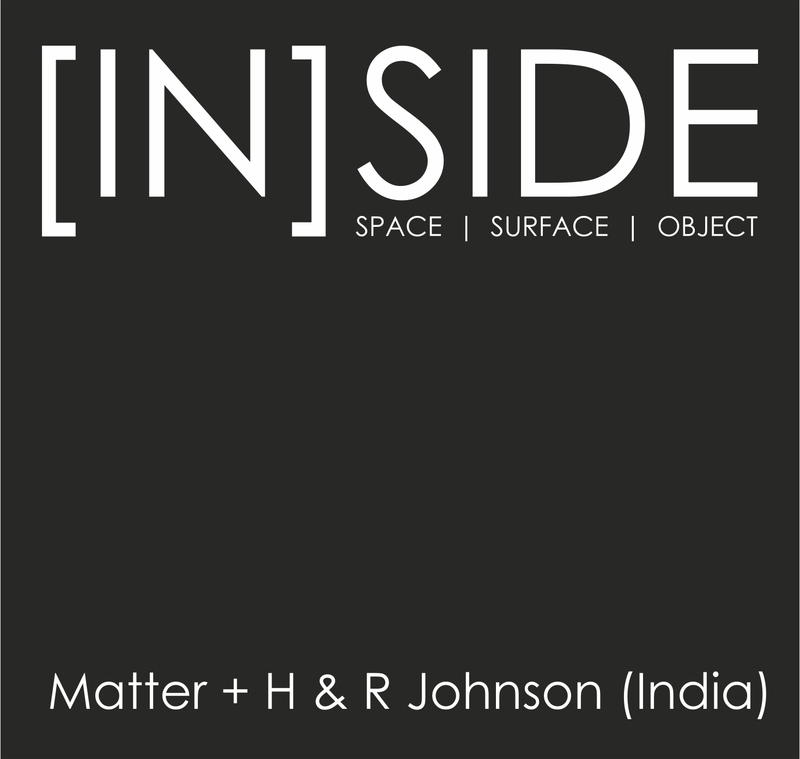 BR: I work primarily using three simultaneous processes – drawings, physical models and CAD models. Often they inform each other and it can be quite messy initially. I begin by laying out the program, trying to find a way to organize it and to distill it to a few primary elements, in terms of dimensions. A preliminary grid is established and then I sketch over this to try and organize the plan with respect to the program and the context. Quick study models are made, photographed and sketched over to begin articulating the composition. This then informs the drawing process again and it goes back and forth. The overlay of sketches over CAD models and physical models is key to the design process. VDB River Mist Project Drawings (Coorg). RP: How important is hand-drawing to your conceptual process? Why? BR: I believe, as Juhani Pallasmaa says, the hand has its own memory and I often find that the process of drawing helps one discover strategies which aren’t immediately apparent. RP: You have developed a certain method – pen and tracing with a certain line quality and mediums. How did this language develop? BR: A lot of this has come from my time at Koetter, Kim and Associates in Boston. Fred Koetter who co-authored Collage City with Colin Rowe, is a great teacher and his idea of an iterative process is embedded in the way I work. And this continues on much after concept/schematic design. Even during working drawings and construction one is always searching for better, more elegant ways of putting things together and much of this investigation is done through drawing. RP: How do you see the interface between hand-drawing, models and computer-generated images? BR: It is a back and forth process. Things do begin with sketches initially but very soon models (both physical and CAD) are made and these then are used as a base to further refine things through overlays. RP: In your studio, many young people work. Do you see them well-skilled to adapt to this process? BR: Not many of them draw. There is a strong tendency to go directly to the computer. I must say though that I don’t think this necessarily is a bad thing. The younger architects are probably wired differently and are able to have the same visceral connection to the act of drawing on a screen as I have drawing by hand. Pallasmaa doesn’t think so – but I am not so sure. Lovely things do get produced through this process that doesn’t involve too much drawing by hand. Due to my own limitations, I find using the computer stifling and it forces me to commit much earlier than I should to a crisply resolved drawing which often tends to have no meaning! RP: At every level, your sketches seem to evolve with the detail of architecture you are dealing with. How do you shift scale in the process? BR: The wonderful thing while drawing is that it is often not a linear process. 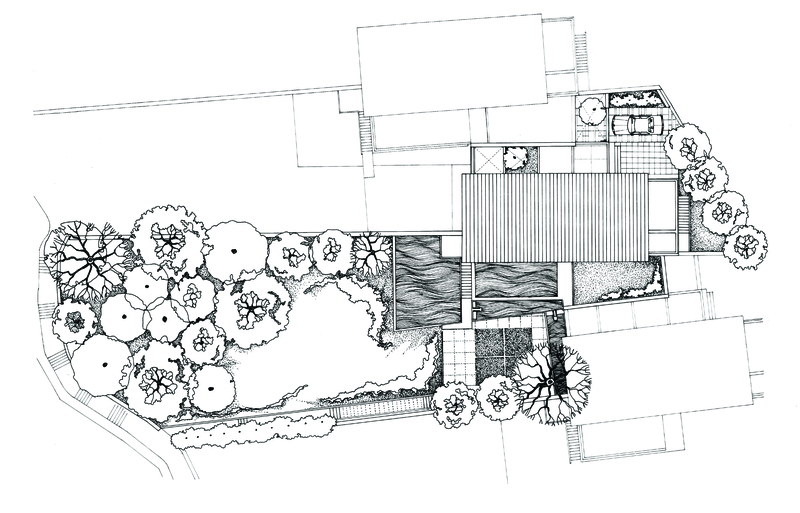 One is constantly shifting scales, thinking of plan and section at once and ideas of details are often developed while working on a conceptual parti. I recently bought a book on Glenn Murcutt’s drawings and one often finds large scale sketches of corners and transitions on the margins of drawings of general arrangement plans and sections. He is thinking and working simultaneously. And it often is the case with a lot of us who draw – to work in this random way. BR: I mostly just use a fine fiber tipped black pen on yellow or white tracing paper. Sometimes I add colour using pencils. The drawings are often scanned and either overlaid on CAD plans or sections or used as they are with some flat colour put in in Photoshop. RP: You must have masters/mentors whose painting/drawing/graphic vision you hold in very high regard. Can you tell us about them? BR: Starting with Mr. Dube, who makes incredible drawings and is a real master of composition, I have had wonderful teachers. 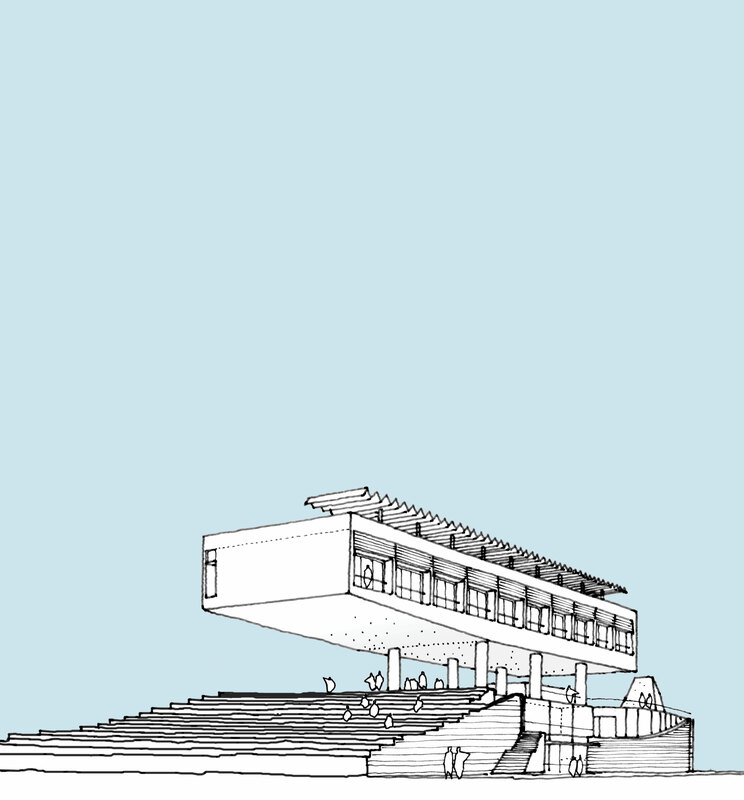 Fred Koetter’s drawings which are masterful in establishing hierarchy and depth, Glenn Murcutt’s beautifully precise line work and of course Aalto’s lovely pencil drawings – I copy from them all. I also love the drawings made by Joe Noero, especially the wonderfully African colour palette and the flat colour technique in Herge’s Tinitin comics or Chris Ware’s work. I often pick colours from here for our drawings. Francis DK Ching too has had a major influence and I once made a whole presentation for a project based on his style of pencil drawings. Proposal for the Waterfront, Crotone, Italy [Venice Biennale 2006] 01. Proposal for the Waterfront, Crotone, Italy [Venice Biennale 2006] 02. BR: It is significant in our practice but I am wary to make a general pronouncement. Different practices work differently and lovely things do get produced. I am unable to think unless I am drawing and am always pleasantly surprised after a session on my drafting table because things come together in ways I did not expect when I began. There is a quality to good drawings made by hand, which one cannot deny. It is sufficiently open ended to further one’s imagination unlike a computer drawing which always looks complete and resolved when it may be neither! 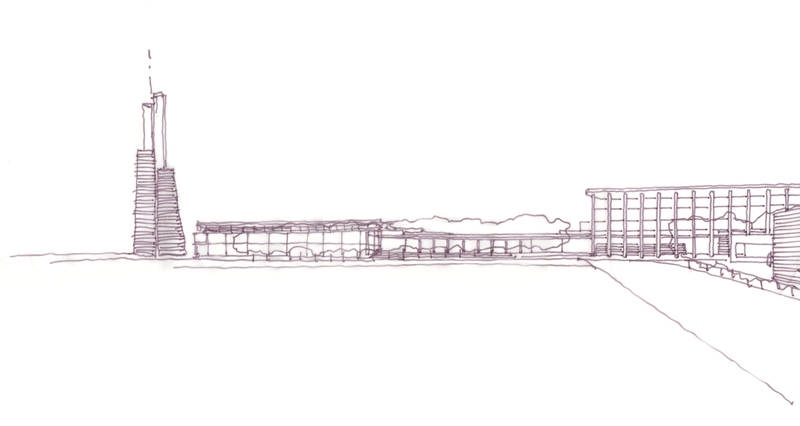 Drawing: Masterplan For Central Coffee Research Institute, Chikmagalur. ‘Drawing to Find Out’ is a curated column on the drawing architecture and the techniques and ideas therein. 01 – Competition Entry for Engineering College, Erode. Competition Entry for Engineering College, Erode. 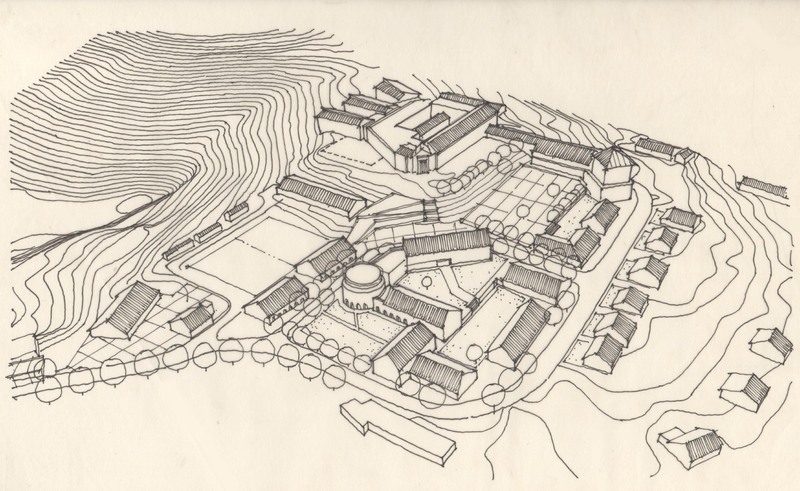 02 – Competition Entry for Nalanda University Masterplan. 03 – Centre for Hope, Tiruchchirapalli, India. Amazing work…….Thanks for keeping the spirits high of viewers, learners, followers, competitors & fellows………!! !